The perfect online gift! Send a Gallery Leather Online Gift Certificate and let the one you care for choose the book and color they love the most. Complete the information below, select “ADD TO SHOPPING BAG” and your gift is on its way. It’s that simple. What happens after I purchase an online gift certificate? 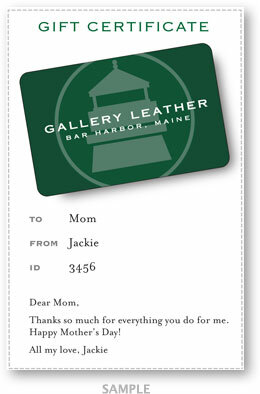 After you purchase an online gift certificate we will send the recipient an email Gift Certificate with all the information they will need to redeem the gift certificate at www.galleryleather.com. At the same time a confirmation email will be sent to you. How do I redeem an ONLINE GIFT CERTIFICATE? Shop www.galleryleather.com and select the gifts you wish to purchase. Click on SHOPPING BAG and proceed to checkout. Enter your online gift certificate code on the payment page or review page and click on REDEEM. Please note that your gift codes are activated within 24 hours after receipt.